Chromesearch.info is a dubious search engine that deceivingly enters the computer and dominate certain settings of internet browser program. This action can be executed by the adware even without user’s approval via method called software bundling. By packing Chromesearch.info to several freeware and shareware, users will never see this incoming danger. Aside from that, this homepage hijacker also have chances of being installed by simply acquiring the main program called Chrome Search. Promoted as a valid search engine that respects the privacy of users. Once installed, the impact of Chromesearch.info is mainly on homepage of the browser. Although this adware is capable enough to make numerous changes, it is only confined to alter internet browser settings. To be more specific, Chromesearch.info aims to replace homepage, new tab pages, and default search engine. Victims will likely to witness critical issues and various troubles as long as the adware exists. Severe pop-up ads and browser redirects are the most common subsequent effects of the infection. Since Chromesearch.info is part of software bundles that are spreading all over the web, users who frequently downloads shadowy applications are likely to become a victim of this adware. Therefore, it is vital to stay away from suspicious web sites. Avoid downloading programs from strange servers and hosts. As much as possible obtain programs only from reputable web sites with notable safety ratings. This is the only way you can avoid getting infected with adware, particularly Chromesearch.info homepage hijacker. This rootkit and virus removal tool is free and easy to use. It scans, detects and removes any rootkit, malware as well as threat like Chromesearch.info home page hijacker. The tool is powerful enough to find malicious items that are hidden on the computer. 7. Click on Start Scanning button to begin checking the system for presence of rootkit and virus. The tool reveals items that were found linked to Chromesearch.info. It also detects and removes other malicious files. 4. 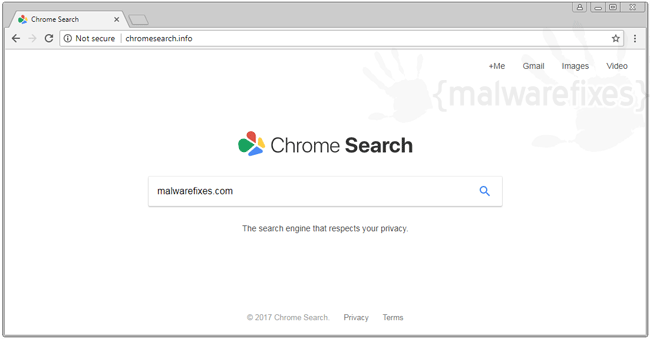 It searches for presence of harmful programs, plug-ins, add-ons, or any data that were found malicious and linked to Chromesearch.info. You need to Clean all items detected by this tool. After the previous scans, you may have deleted Chromesearch.info from the affected browser. This next step will ensure that no more module of adware will be left on the browser. This free tool scans and checks the browser for unwanted add-on and extension, and if found, Avast Browser Cleanup will give you a report and suggestion. 4. Avast Browser Cleanup will confirm before it permanently deletes the add-on. Please click Yes to proceed with the removal of Chromesearch.info on the affected browser. Cleaning your internet browser from clutter and unwanted add-on/extension is a must when dealing with Chromesearch.info. The procedure below discuss on resetting various browsers to its default state. This function will reset your home page, new tab page, search engine, and other areas affected by Chromesearch.info. Unwanted extensions will also be removed from the browser. This will not affect your bookmarks, history, and other saved data. You may also run Chrome Cleanup function from this page. An integrated tool from Google Chrome but with more advanced Adware scanner feature. This section describes how to remove unwanted extension from Firefox that may be related to Chromesearch.info. This process can fix many browser issues by restoring Firefox to factory settings without affecting your essential information (bookmarks, browsing history, passwords, and Internet cookies) on the browser. If you desire to remove only specific extension, please see manual add-on removal from this link. 4. Firefox browser will close and start the resetting process. When done, it will display a list of restored data. Chromesearch.info home page hijacker should be gone by now. Click Finish to open a fresh version of Firefox. Your data like favorites, bookmark, and history will remain it the browser. However, this process may delete add-ons by Chromesearch.info and other unknown objects. If you prefer to carry out the procedure manually, please view instructions here.